The tensile architecture bridge connects the Cedar Rapids Convention Center to the car park across the street. It is designed to help manage the traffic and replaces a parking layout which was destroyed in a flood in 2008. It is the perfect solution for managing foot traffic flowing to and from the parking structure across the street. 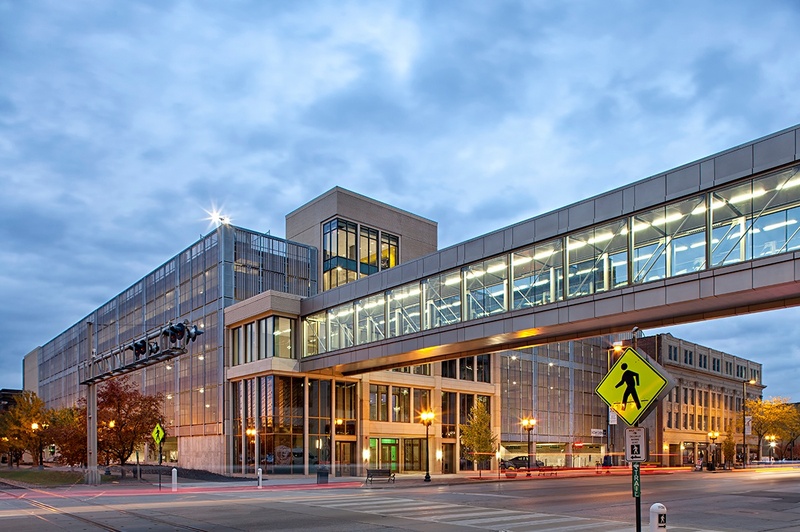 The lead architect, Gary Landhauser said part of the challenge was to design a utilitarian structure that would fit into the downtown historical fabric of the city. The appearance of the garage was from decorative metal panels to frame the exterior which also shielded the view of the parked cars from the street. The galvanized steel rods supported the structure and also aesthetically were in line with the design goals of the garage. 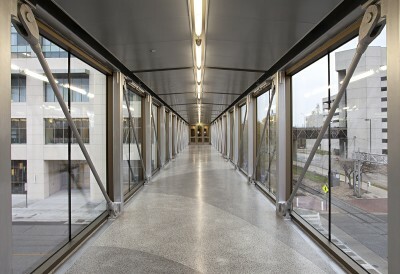 The skywalk uses the Ronstan ARS4 system and consists of 16 x 2 inch diameter rods with forks and 8 x 2.5 inch diameter rods. For more information on this exciting project click here.